Las Vegas is a wondrous playland that is often overshadowed by the reputation of seedy gamblers and an excessive indulgence regarding forbidden actions and experiences. In actuality, Las Vegas is a city that caters to anyone and everyone interested in exploring a non-stop explosion of bright lights and high energy. This is a city that never seems to sleep as Elvis impersonators flash and glitter at every twist and turn. The city serves as a 24-hour playground, where business keep odd hours to entertain and satisfy the masses. At any given time, you may find fitness centers, spas, video stores, supermarkets, bars, nightclubs open to accommodate the night owls still stirring during the wee hours after dark. 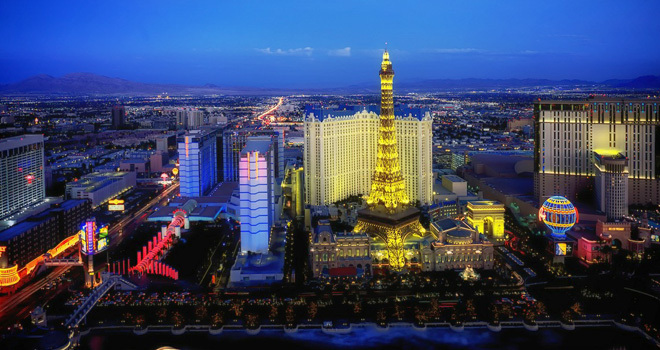 When it comes to convenience, Las Vegas definitely knows how to show its guests a good time. To enjoy the thrill of winning thousands of dollars at a Craps table to taking your time at a slot machine, the Las Vegas casinos are mainly situated on the Strip or Downtown section of town. Shuttle buses and other modes of transportation are available to usher you to your next destination, although walking from one point to another is not unheard of. Before hitting the casinos, be aware that it is a dog-eat-dog world and knowing how to play, as well as bet, will most certainly come in handy. While the attractions and main sights of the city are enough to seal the deal, it is the hotels that also create a one-stop shop and arena of pleasure. Usually, most of the accommodations about town offer easy access to a casino, but not everyone is tempted by the lure of Jackpots and hitting Blackjack. For this reason, accompanying an entertaining stay in the city is a wide-range of extravagant themed resorts (such as the Aladdin to the Hard Rock Hotel) that pleases the likes of the mother of three to the anxious businessman to the budget traveler. The nightlife is bustling with excitement, which can be enjoyed before or after you settle at one of the numerous all-you-can-eat buffets, filled with steak, shrimp, and other delicious cuisine. While the city is filled with enough to keep a visitor quite busy, there are also many interesting side trips to explore, including the nearby Death Valley, Grand Canyon and Hoover Dam attractions. When visiting this attraction, you will come across two million lights, as well as an impressive sound system. If you’re lucky, you might be able to catch the filming of a major motion picture. At this site, a variety of animals can be found, including elephants, panthers and leopards. You should seek out the Mirage Hotel Casino in order to take advantage of this experience. Honeymooners and those who are in-love will surely enjoy a romantic gondola ride that visits sights, such as the Grand Canal Shoppes by the Venetian Hotel Casino. Trekkie fans may enjoy this attraction at the Las Vegas Hilton, which presents exhibits involving popular characters, as well as more than 200 Star Trek-related items. Located at the MGM Grand, you will have the chance to view the King of the Jungle as they interact with one another within their own natural habitat. When traveling with the family, the children may enjoy what some consider one of the greatest water parks throughout the nation. Throughout the year, this site also holds entertaining events, such as the Miss Hawaiian Tropic Pageant. Bring your cameras to capture this awesome water display, which offers water jets that enter 240 feet into the air. Additional features include choreographed lights, as well as relaxing classical music. As you explore the many interesting hands-on displays, you will also learn of many individual and team record-breaking feats through a self-guided tour. Art lovers will enjoy the many sculptures and paintings hailing from late 19th and 20th century artists, including original Picasso, Monet and Van Gogh works of art.